How's it going? Did you finish that book by the pool? Taste the best watermelon ever over at your neighbor's yesterday? Take off your sandals and walk barefoot across the grass right after it stopped raining? Or while it was raining? Since I've had to hang up my running shoes for a while (oh, stop, you're going to bust my stitches! ), me and Hammy went to town on some of those UCBs and some of those newly-gifted NBUSes, and some of those challenges we love. Perhaps you'd like an iced tea or a lovely crisp pinot grigio? What we have here is a glossy background from the UCB (unfinished card bits) box. I made this by swiping the colors from DI (or maybe SU) ink cubes across an acrylic block, spritzing it with water, and turning it upside down on a glossy card for just a few seconds. When it's carefully lifted, you get a fun organic pattern. Then you get addicted and make a bunch of them, cuz no two are alike, and they end up as UCBs. Except for the U, the die elements I used are from a Spellbinders die called "Sing It Loud 2," given to me by my friend Sheila. I thought this previously languishing background worked well with the rock 'n roll vibe. Last, I attached the panel to a black card base, which you can hardly see because of the shadows. Thank you, Sheila! Nothing UCB on this card, but a couple of NBUSes were happily used. The schpark was the cool Stick Frames die from Memory Box which came from my friend Bonnie. It was Hammy's idea to go with a Christmas card since we are light years behind on our resolution to make lots of Ccs all throughout the year. Cough. The dark card panel looks like a lovely flannel gray, but it snot. It's pitch black, but all the shininess of the gold mirri card and white glitter card played havoc with the black. The NBUS "Noel" is from Winnie & Walter. The schparkling exploding white tinsel ropes are also from Memory Box. 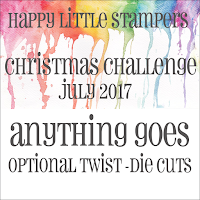 HLS July Christmas Challenge: Anything goes ~ twist: dies. Merry Monday Christmas Challenge: Christmas in July. I used Challenge #212, which was gold, black, and white. Having used the die to make the stick frames in the Christmas card, I thought I would see if I could emboss with the same die. After wards, I cut out the "windows" and made a shaker. I know the sequints look a bit odd, but the truth is the two middle points under those sequints didn't make a very good impression. It bothered me more and more as the process evolved, but, of course, there comes a time in the making of a shaker card when you are not going to give up and start over come hell nor high water. You just aren't. So there I was with it all done and it's a really cute shaker, if you don't mind my saying so, but those two bare spots were like, well, like pimples on the night of the prom. You know how you put on too much liquid Maybelline to cover them up and that only made them more noticeable? That's how I now feel about my odd-looking sequints. Oh, well. At least now you know the reason I stuck them there and you won't think they operated on the wrong end of me! Cornelia is so great with the critter cards! Well, any cards really, but especially the critter cards. Hammy and I mulled some wine, er, I mean mulled over some various options on ways we could CASE Cornelia. 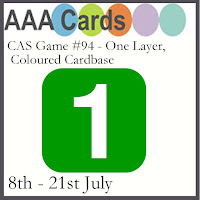 We noticed that another great challenge going on right now is the "one-layer-colored-card" theme happening at Less Is More (in collaboration with AAA Cards). So what happened was, we decided to use the wild and wonderful wasabi green color of Cornelia's bird as our OLC rather than for our bird. Next, we had to go through the Bird Drawers and decide on which one to use. Gunther the buck-toothed goose got the nod. For the sediment we chose this fun NBUS stamp from Dylusions, inked in black and embossed in clear. (Thank you, Brenda!) I also did an old-timey technique of running a black ink cube around the edges of the card to keep the viewer's eyes from following the wild green off into infinity. I finished off with some orange coloring, shadows under Gunther's skipping webbed feet, and, of course, googly eyes. Wouldn't it be inspiring to have that saying hanging just inside your front door so you saw it last thing you left the house and first thing you came home? Even if you're past the age of skipping, you're not too old to remember how it felt! AAA Cards: Colored card base in collaboration with LIM. Less Is More: One-layer colored card base in collaboration with AAA. TIME OUT Challenges: CASEing Cornelia. An absolute feast of fabulousness! I think you need to be confined to barracks more often, you and Hammy are really on a crafting roll. A fun selection of cards - pleased I found your blog because it makes me smile! Not sure I can skip any more though! A post with many cards !! Loved the UCB background ad the goofy green bird ;) ! Always a pleasure to pop over to your blog Darnell, a smile is guaranteed. Loving that quote on the last card, going to have to try that out to see if it's true! Great card. Thanks for playing at AAA Cards. Wow, what a collection of cards you have here, love them all. Yes I made it to the end and smiled all the way - love your cards and your commentary Darnell - I am glad to hear that you and Hammy are having fun again in the playhouse... and it shows. That black/gray Christmas card is amazing Darnell, and the red and kraft Thanks card is pretty darn good too! As for Gunther - he's gorgeous! Fabulous cards Darnell! Love the sticks die but you daft bird really is too funny, love it! You know I have so many UCB and try to use them but they don't seem to decrease, yesterday I realised why... See, I make the card and want to add something ... Maybe a heart or a butterfly but the one in the box is the wrong colour, so I cut like 6 more in various shades... Duh! No wonder those boxes are getting bigger! A great range of cards and they are all so different. Your crafting fantasy is endless....!! Hi Pat, hows it going babe, lol. I love all your cards but the duck wins the prize with that great sediment. It was a bad day today with lots of tears over mum and I thought nothing could lift my mood and then I came here. Your writing is such a lift to the soul, I love you for it. Dont ever stop hugs Aileen. Awesome cards! Always love reading your stories! Lovely cards. I do love the skipping sentiment and the fun tie die look in the first card. It is hard to comment when you post so many lovely creations! I like them all! Such a fun post, Darnell. Look at you getting all busy with the cardmaking. Yay! You must be feeling good which is awesome. I adore that last card. It's so fun and goofy and I love that sentiment. Thanks for the smiles this morning. :) Hugs! I'm happy you are back to crafting and I'm sure Hammy is too. You can't let his inspiration gene atrophy. These are four fun cards. 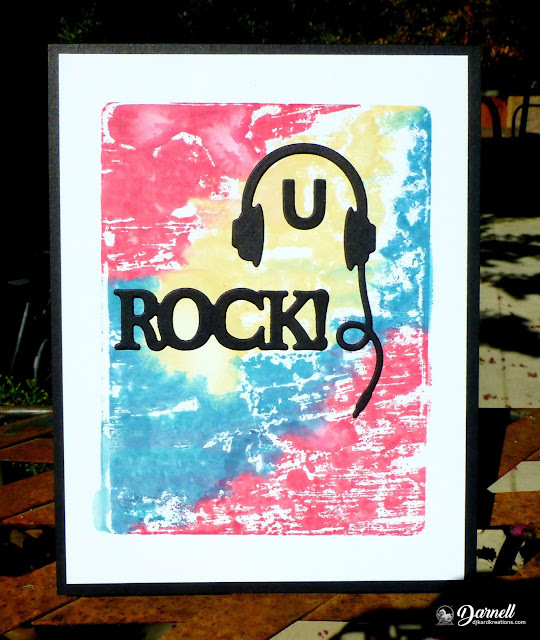 I like the u rock- it is great for the boys and the Noel card is beautiful. That white tinsel ropes are so cool. You've given me some good ideas to use my stick frames as they are in my NBUS box. Gunther is a hoot. Wow, what a fabulous set of cards, yes, even the one you're not so keen on. We won't mention my Christmas card count this year, single figures... Well. zero is a figure right? Hi Darnell, Fab cards. I really love the goose one. Fab collection of cards, Darnell!! Wonderful background on the first card, lovely Christmas card, and the goose card made me smile! Hope you are feeling better! Take care! Good to see that you're still getting creative in the Playhouse with Hammy. A lovely selection of cards. Can't view these cards and read your post without a smile. Love it. Oh my goodness--you're on a roll, my friend! So much creativity here! The Christmas card is amazing & I so love that fun sentiment--yes, it would be good to have hanging somewhere to frequently be seen! Sending happy thoughts & hugs! Great minds, indeed! It does appear we were on the same wave length. Love that goose...(at this point in my life I'd love any goose. Enough of the wishful thinking, back to the cards.). But that's not all...look at all these cards. You must of locked yourself and Hammy in the Playhouse and didn't eat or rest for several hours. Love the dry embossing on your shaker card...and what a card it is. Those tiny squares had to be a pain to isolate your shaker bits. Even on the Christmas card the intricacy of the diecuts must have taken a chunk of time. And the background on the first card lends itself perfectly to the diecuts you chose. You're really on a roll. Keep it up! Wow, Darnell, you have been busy. What great cards. Hope you are doing well. What a fun array of wonderful cards you've shared today! I adore the little shaker card with beads, and that skipping card/sentiment is just too much fun1 Hey! 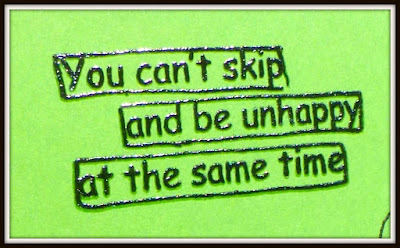 I can still skip with the best of them............(only in my mind of course) ha! :) Skip to my lou my darlin.......earworm!! You are a superstar card maker. I hope you're feeling betterer and betterer as the days go by, and that skipping is on your horizon! Love the shaker card, the little Windows is such a heat idea. I understand the reasoning but didn't even think the sequins were winking at me from weird positions! Four little beauties here Darnell, especially like your LIM card, fun image. Ha ha ha, still laughing over Gunther - that is the best duck stamp ever and those googly eyes elevate him to simply hilarious! You also found the best sentiment for him - what FUN!!!!! As for your questions I have to answer NO to all of them, although at Pinot Grigio may be opened tonight to calm my frayed nerves (just too much work, that's all....). Cool little shaker card - those sequins didn't bother me one litte bit. But as always you have a hilrious explanation for your process! Hope you'll be skipping soon again! All are so cute and creative!!! 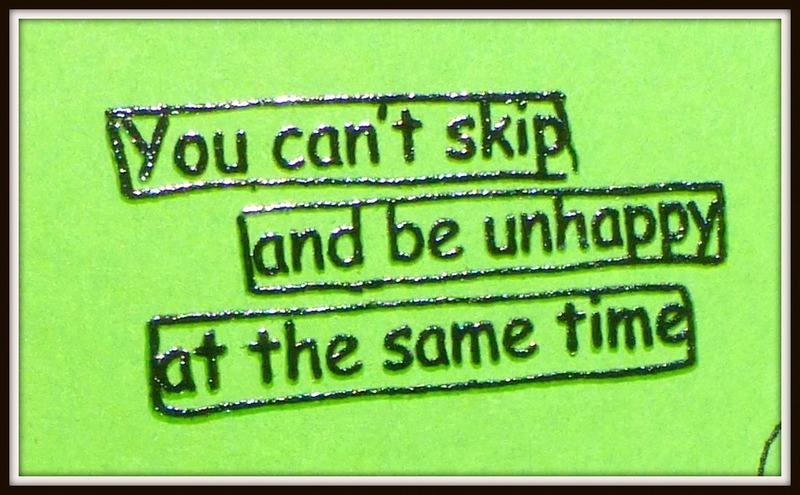 Hope you are feeling more like "skipping" everyday... (When I try to "skip"
I feel like a clumsy elephant tip toeing? through the tulips! Fab st of cards, Darnell - you really did go to town!! 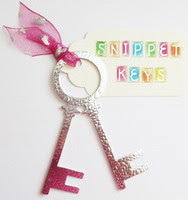 Especially love your use of the Stick Frames die! What a super card - so bright and cheerful! Love that sentiment! Thanks for playing along with us at AAA Cards! I'll definitely have to try out that background idea. It turned out so cool! And, yes, it's perfect for the "U Rock" die cut. Makes a great card for a young guy, especially. Beautiful Christmas card, too! I went nuts for a gold/white/black combo last year and I still love it. Gosh, is that the same tinsel die I have, I wonder? I'll have to check. Love what you did with it, plus you put the stick frames to good use as well. 'Kay, you're way too hard on yourself about the sequins and, no, you can't stop in the middle of a shaker card. 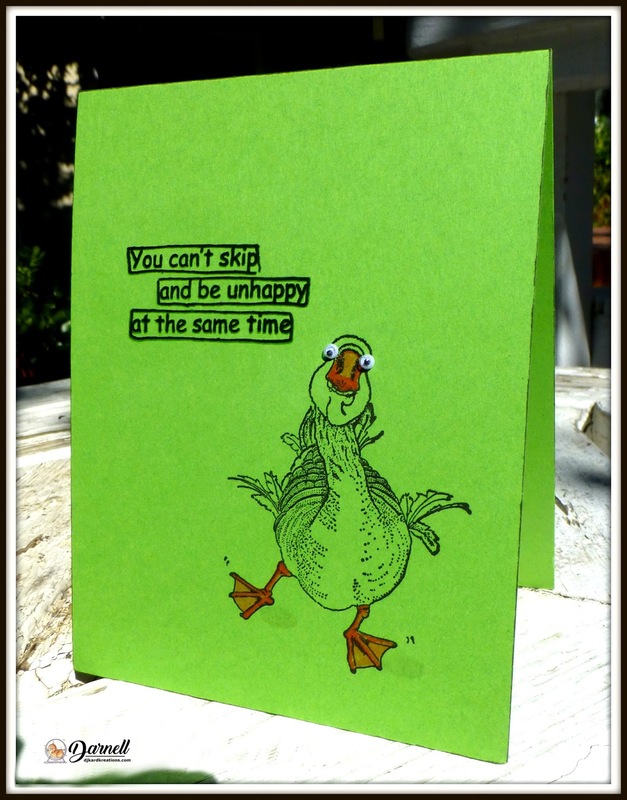 As far as your awesome lime green skipping duck card goes, I love it so much I could spit! Ain't it the truth, though? Can you imagine an unhappy skipping person? I like skipping. Why is it so fun? At my age I have to hope nobody sees me. When I walk LuLu I sometimes run with her a little or sing "The Happy Wanderer". She likes it. Rich hangs back, far back with Wally. Great cards, Darnell and Cornelia's card is priceless! WOW ! You've been busy Darnell ! Love them all ! A very eye catching array of cards and especially with the fun take on our challenge with Gunther the goose ! 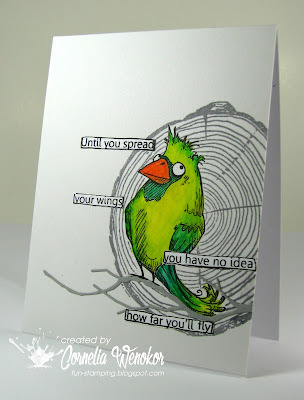 What a clever idea to combine those challenges and to give the vibrant green of the bird (TO) to your card base ! Love it ! It seems that it is not only you and Hammy who drank wine...;-)) Such a fun card ! Thanks so much for sharing and for playing along at Less is More ! You and Hammy have been busy, my friend! Lots of fun goodies in this post! Glad you like the stick frames. I hadn't thought to do a shaker card with it. Thanks for the idea! I've got to skip along. Day's awastin'! Such a fun post, Darnell! Love all your cards, especially the adorable duck and sentiment!! And, don't laugh, but I actually got up and skipped across the room--wasn't sure I still could! I don't jump as it hurts one of my knees and I just don't have think of skipping. But yeah, I still can!! Love them all but especially the green one! No skipping here I'm afraid, too many large holes in the garden to fall down, with the builders putting the drainage in. Dang, girl!! Nooooo....YOU rock! That base is amazing! So glad you didn't just toss it like I would have because my UCB box is full.... That's a fantastic card! And your Christmas card! Well, the Star of the East now has competition! I love the shimmer and shine you've got going on here. Against the black, it really pops. Gorgeous! And I rather like that shaker card! The larger sequins look just fine, if you ask me. They look like they belong there. I like it! And the skipping goose...with googly eyes no less! What a fun card! This will most certainly make its recipient smile, and maybe giggle, like a gaggle of geese! Very fun. You are on a roll, Darnell. Maybe I need surgery to get some of my projects finished off? No thank you. Love that crazy goose! I feel the need for another paragraph. Yes, the two bold beauties. Snot flannel gray? Well it could be. Would work just as beautifully. And then, oh yes, the badass first one. Long live rock and roll. Perfect BG for that sentiment! Off to catch up on what I've been missing. Hope you're well. Love your cards dear Darnell! The shaker takes me breath away! So many gorgeous cards Darnell! Brilliant cards! I love that last one! It's a winner for sure. Wow, card after card, so fun! I tried to pick a favorite but just could not. The Rock one is so fun and fab background, the elegance of the Noel card, the amazing shaker card with 3 shaker boxes, and the fun chicken card, if we weren't having a heat wave in St. Louis I would be skipping to the mailbox when I get off the computer (I just might anyways) and your bird card is cute and inspirational. Have a wonderful rest of the week Darnell! Well, that was one fabulous post with great cards. 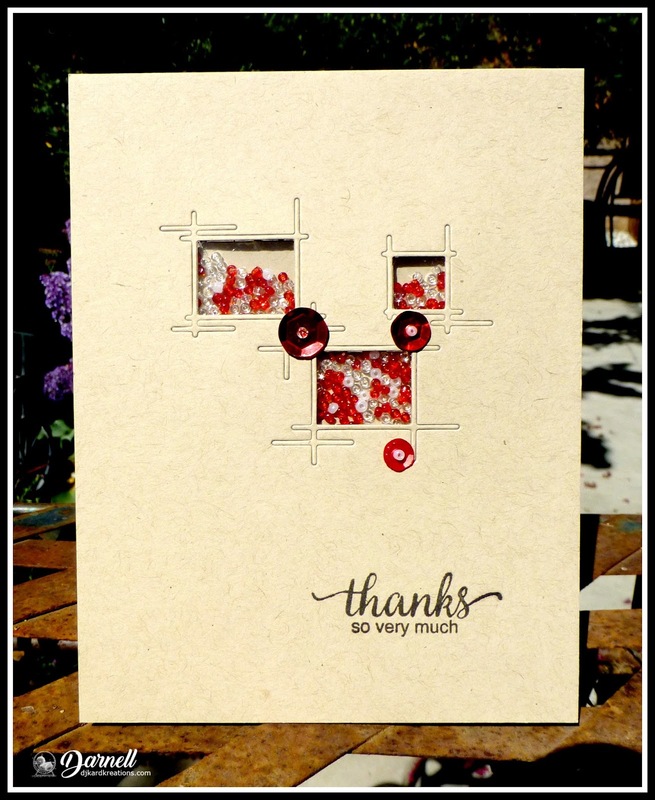 I took you up on the offer of iced tea or pinot grigio and had a glass of each while I read through it all and oohed and aahed over the cards, especially the two using the stick frames die - wonderful to have more inspiration on how to use them!! Cheers to Hammy for all his help on these! I've missed my visits here, Darnell. Darn that busy summer. Anyway, I was rewarded with so many lovely creations, especially your stunner for Time Out. Love those googlie eyes and your bright green background. 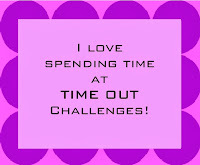 Thanks so much for playing along at Time Out. wonderful cards Darnell, your sequins look like knobs that controll the shaker bits...love your challenge card perfect for all three...and your sparklie gold and black is so delish. You definitely ROck! Wonderful cards Darnell.. I love all of them especially the first one.. You Rock...!!! Amazing cards Darnell! Love the first one with all the colors - such a fun technique. So glad you explained what UCB is - I was about to ask Mrs Google ....:) Love your pretty Christmas and shaker cards too and I love that die! And who doesn't love goofy cards - they're the best - and you chose the perfect sediment! Wow! Darnell, amazing cards!!! 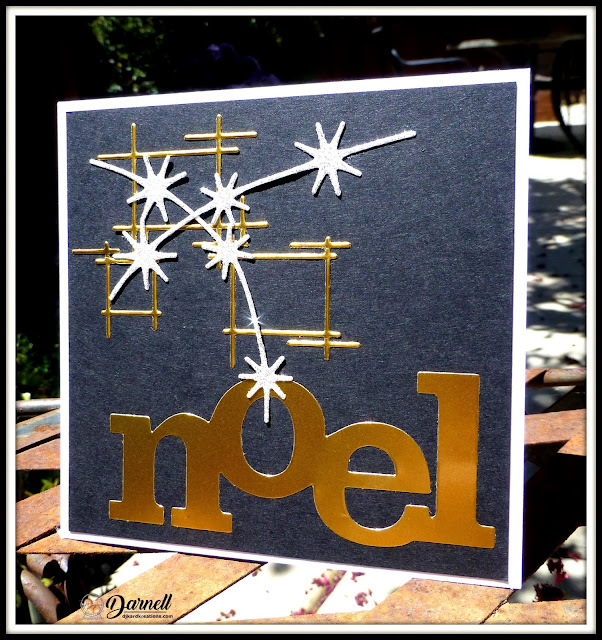 Love your Noel card...I know what you mean about photographing black cardstock with shimmery accents. It looks fabulous though! Thanks for joining HLS Christmas Challenge! Oops, I was so excited about the fun skipping that I forgot to thank you for sharing with us at AAA Cards. Big thanks!!!! I am loving the UCB card. That background is so cool!! Need to try this I think. Your Xmas card is so pretty. Love the Stick frames that you used and then reused on that shaker card. If you didn't explain that the sequins were covering a mistake, I would not have thought your design was wonky. It looks fabulous!!! Your last card is my favorite, though. I ADORE that fun chicken but that sentiment ROCKS!!! FABULOUS design on each one of these cards!! how fu is your one layer card, thanks for sharing with us at AAA Cards! Well, I visited to finally comment on your gorgeous Christmas card Darnell, and I think it is a very stylish and elegant design, but as usual, I am blown away by your additional cards! The shaker card is amazing but the skippin' chickin has made my day! I'm so glad your recovery is going well, and we are slowly getting there too!